Happy 1st Birthday to THE PRINT SHOP | and it's getting a makeover! — Allie Dattilio, fine artist. Featuring stretched prints, Toward and Sky Meadows. Office design by Katie Davis Design, photo by Melissa Fitzgerald. A few challenges we’ve faced involves the made-to-order nature of the printing process, and the long lead time involved. Instead of holding a large inventory of in stock prints (a scary risk to invest so much $$$ and have prints just sit on the shelves! And would force us to limit our options) we make each print as the order is received — inevitably this slows down our turnaround time as we wait to receive them from our printer and get them signed, prepped, and ready to go back out the door to our clients. To overcome this, we have brought on Renee to handle all ordering and shipping, and have completely streamlined our process to get them out the door as quickly as possible, and cutting down our lead time by a week! Capturing the nature of the gold leaf in an image has been the greatest technical challenge I have faced this year. First step in achieving the highest quality and most accurate images was a MAJOR investment in a fancy new camera this past month. Prior to that, I’ve been borrowing friends’ and family’s, and hoping for the best. This new camera (the Sony aRII) is a whopping 42 megapixels, which allows me to print crisp images larger than before— we now offer up to 30”! While the images have been more accurate than ever before, they still lacked the metallic quality of the gold leaf originals. I’ve been wracking my brain (and Google) on printing options and techniques that could help me achieve a metallic finish that has become my signature , and just a few weeks ago I had an absolute epiphany! I ordered a few premium quality gilding paint I’ve used in my paintings in the past— a pure metallic gold, and tried my hand at painting on a gold finish. IT WAS STUNNING. And the answer to all of my wishes. After experiencing that hand-embellished touch, I’ve decided I just can’t go back! 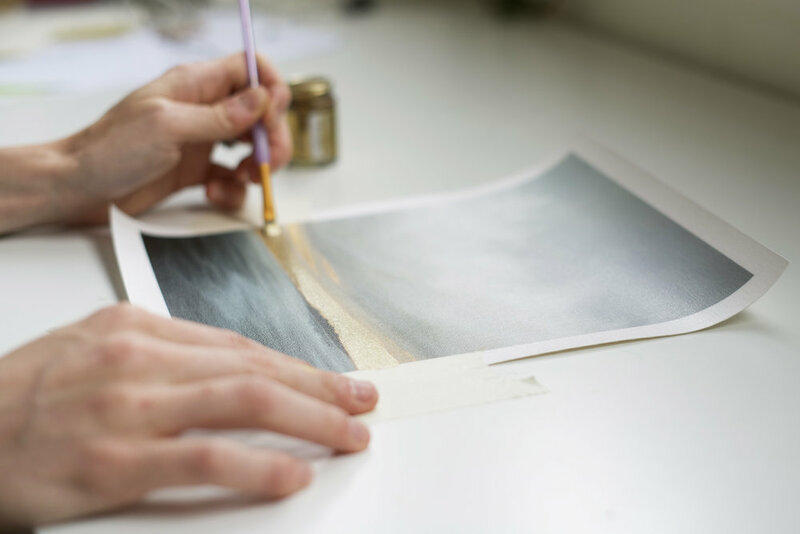 Transforming each print into a one-of-a-kind piece of art, hand-embellished by Allie. So here is the BIG ANNOUNCEMENT(S)! Moving forward, ALL PRINTS will be hand-embellished with metallic gold. Hand-painted by me! That means each print be a one-of-a-kind, hand painted piece of art. I am SO excited to be able to offer this quality of artwork, and at a more accessible price point than my original paintings. The Print Shop will now be open ONLY the first weekend of each month! To help streamline our process even further (if you know me, you know I’m a fan of “batch-working), The Print Shop will now only be open the First Friday through Tuesday of each month. It may open here and there for special occasions/holiday sales, but for the most part I’m going try this out for the next few months and see how it goes. For the next two weeks The Print Shop will be closed for construction, and re-open with a fresh makeover with all hand-embellished prints the First Weekend of November! If you would like to be notified the moment the shop is back open for business, add your e-mail to our Print Shop list via this form! Okay, so let me hear it. Am I crazy to try this? Are you as excited as me to take my prints to the next level? !